But no matter how long your pup’s panic has been in full swing, the following top tips should soon soothe his jangling nerves. 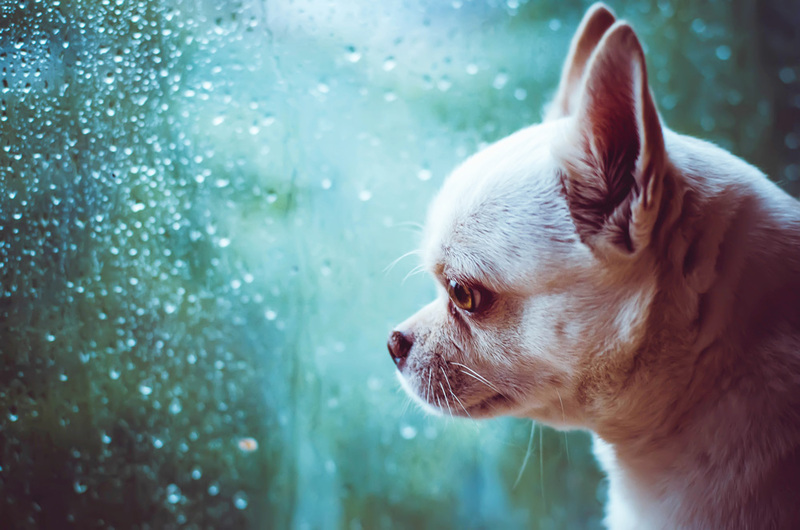 The million-dollar question – Why are dogs scared of thunder storms? Vets and animal behaviorists have studied this topic to the nth degree, and yet there’s still no concrete answer. The consensus is that the noise of the thunder and the flashes of lightning are unpredictable and, to a dog, seemingly come out of nowhere. However there’s also the complexities of how dogs are hardwired to pick up on changes in air pressure, and are also able to hear the super low-frequency rumbles of a storm before it arrives. Another hypothesis is that dogs may even suffer from shocks, as static electric builds up as a thunderstorm approaches. Herding breeds (such as Border Collies) are especially affected, as well as naturally nervy dogs who are anxious in everyday life. Like a good Boy Scout, you should always be prepared! First things first – you should always be aware of the forecast if it seems that bad weather is swirling overhead. 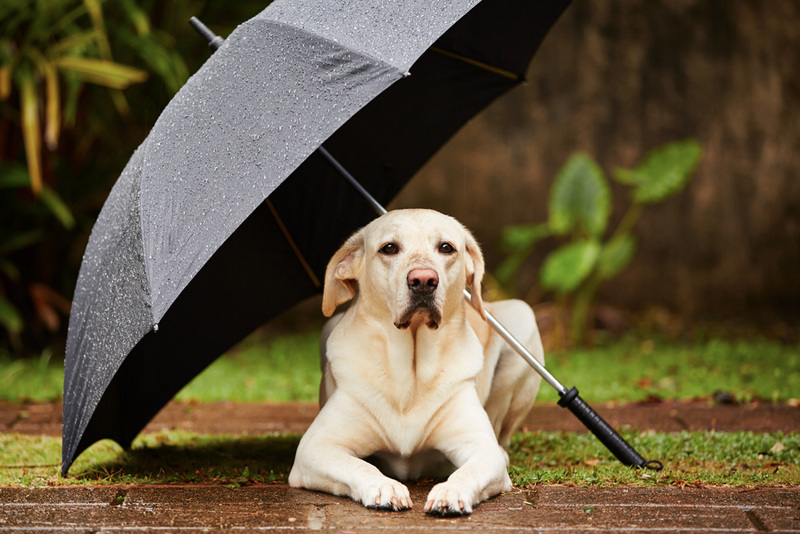 Getting caught outside in a storm can be incredibly distressful for your dog (and you can times that by ten if they also hate getting wet!). All in all, it can serve to worsen their already serious fear. Next, you should presume a storm is just around the corner, and launch into some positive association training with the help of a downloadable thunder storm app or soundtrack. Over the next two weeks, play the storm audio at increasingly louder levels, and while doing so play with her, and feed her treats. Once you switch off or pause the audio, stop all play, and all treats – the point here is to link the sounds of thunder with tail-wagging happy times. Reward calmness all year through. Starting TODAY. You may have trained your dog to sit, lay and maybe even shake hands. But what about training them to settle down? This isn’t nearly as impossible as it sounds, either. Simply put on a special “inside” leash, and direct her to lie at your feet, rewarding her when she follows your instruction. 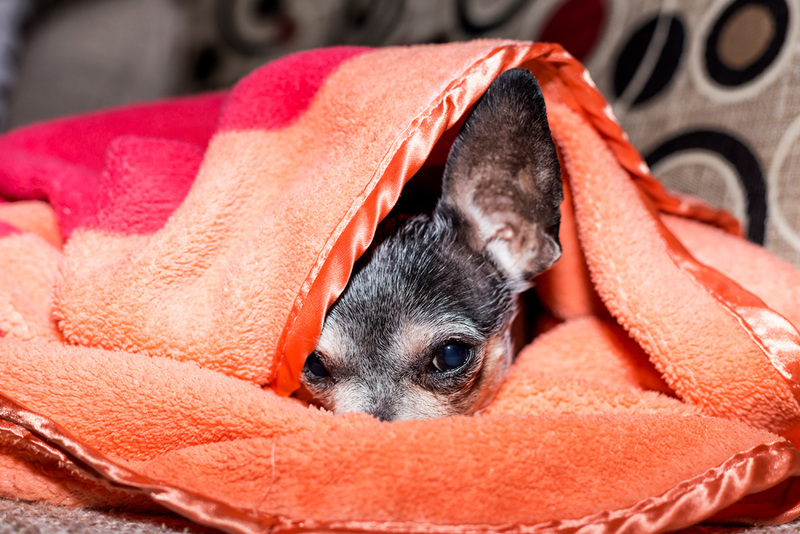 Practicing this routine all year through can ensure that your pup has a reassuringly regular cue to follow, even as the thunderous rumbles begin. Do as much as possible to lessen the effects of a storm by getting the basics covered – that includes drawing the curtains, having a TV or music on medium-to-loud, and creating a cosy hideaway – complete with overhead blankets and plenty of pillows. You should also observe your dog during a storm – is there a place she tries to gain access to – such as a bathroom, office or basement? If possible, try and prepare this area with their blankets. Over the course of the storm try to keep them engaged – with treats, training and toys where possible. Not so long ago a product hit the shop shelves that claimed to calm the nerves of our canine mates. It was called the Thundershirt – a type of tight dog jacket that provides for an experience of pressure and closeness. 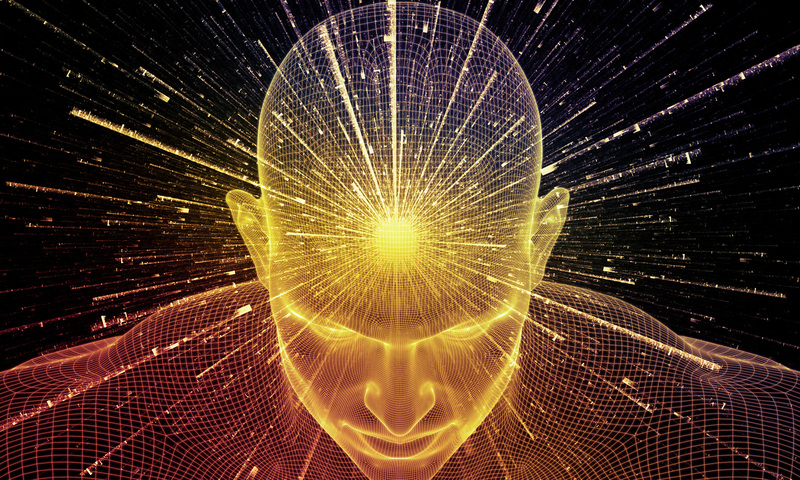 It works in the same way as swaddling a baby – reminding them, on a subconscious level, of being in the womb. You can create your own DIY version of this jacket by purchasing a suitably sized human tee-shirt, and placing your dog’s front legs in the armholes. If you get the sizing right, this should provide at least a partial sensation of pressure. Nope, we’re talking CBD dog treats (CBD standing for Cannabinoids). Contrary to common misconceptions, CBD is nothing to do with recreational cannabis. It’s simply derived from the same family of plants – namely hemp (the planet material that’s used in everything from clothing to cosmetics). CBD dog treats are proven to relax, ease anxiety, and calm even the cagiest of canines; and they do so by interacting with something called the ‘endocannabinoid system’, which is ‘in charge’ of physiological reactions including appetite, pain-sensation, mood, and memory. So effective is CBD, that it’s even been shown to help with a multitude of other dog conditions, including skin allergies and dry, itchy skin (you can thank the high content of Omega 3 fatty acids for that); as well as easing seizures and epilepsy, and even overcoming low energy. Eddie the English Springer could be in the eye of the storm, with a FOMO Bone in his mouth, he’s going be a whole lot less stressed.